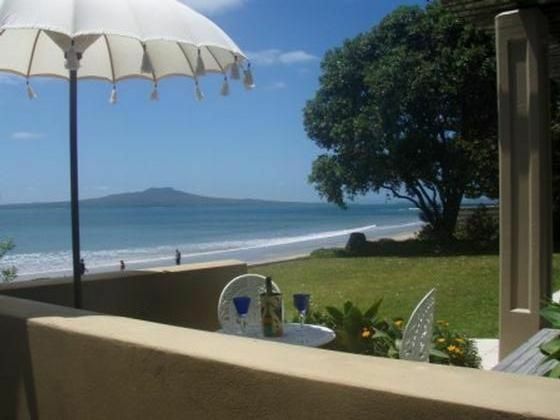 Look through this wondrous beachfront courtyard out to the Auckland Hauraki Gulf whilst unwinding in this fabulous Suite. With a superking bed fit for Kings and Queens you'll quickly unwind and settle into holiday mode. Large doors open onto your private courtyard area with spa pool. Why not take walk along the beach front exploring the coast and nearby marina. Special extras will add to your enjoyment. Great place to stay. Very gracious and accommodating hosts. Clean and comfortable. Thank you for your comments . It was a pleasure to have you stay here as you left the suite in a beautifully clean condition . My husband had some surgery in Auckland and we had to stay in New Zealand a bit longer than planned. We looked for a place that he would enjoy with his lack of mobility and my need for the outdoors. This place covered it and more. The beachfront and walks were fantastic. We loved watching all the people and the dogs walking and playing on the beach. We nicknamed it Happy Dog Beach but I think EVERYBODY was happy being on that beach. Not just the dogs!! Helen and Clive were wonderful hosts. We felt like friends when we left. If we ever come back to NZ we will most certainly stay here again. Thank you Clive and Helen for everything. It is a beautiful property but not being able to switch the spa on (as that requires the owner to do) or light the fireplace without his permission was annoying considering what I paid and how it was advertised. Take note there is a contract to be signed when arriving that has conditions not advertised on bookabatch. eg the fireplace rules, number of guests allowed. While not advertised it is also important to note there is no stove or hotplate...so no home cooked breakfast. Great ocean front property, with glass walls around the patio that made sitting outside in the wind possible. It was very windy at the time of our visit, and we wouldn't have been able to sit outside comfortably without the windbreak. Beach front is wonderful! Suite is very comfortable, very clean, and with all amenities needed.